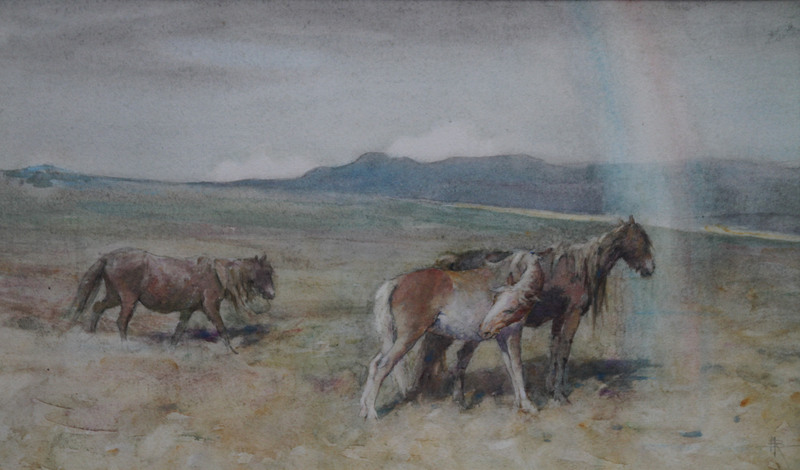 In excellent condition and finished in a fine frame and mount this is a very accomplished painting by the the noted animal and horse painter John Nathaniel Hughes Baird. He exhibited many works like this and was famous in his day for these scenes of horses which fetched huge sums at the time. This is signed right with his monogram. It would have been an exhibited work circa 1918. The painting depicts young horses in an open panoramic landscape with a rainbow. Framed with mount. 27 inches by 20 inches. Good condition.